Threading is an ancient form of hair removal that has slowly gained popularity throughout salons. A threading expert uses two cotton threads, wrapping them around a line of unwanted hair, and removing them. This form of facial hair removal is easier, safer, and more efficient than waxing. This is quickly becoming the most effective and popular technique for removing unwanted facial hair. 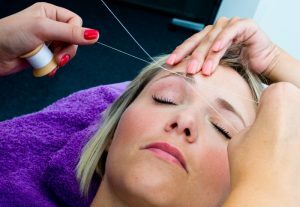 With many different benefits, threading could be the better option for you! This is a great way to remove facial hair without the annoying redness or use of chemicals, it also lasts longer and the hair grows back thinner. Threading allows you to get the treatment done and carry on with your day as though nothing had happened. Waxing can make your skin red and irritated, even causing breakouts for some people. But with threading, there is no need to worry about these after effects. Our estheticians are experienced in threading and can give you the look you want! Schedule your appointment today and rid yourself of those unwanted facial hairs!